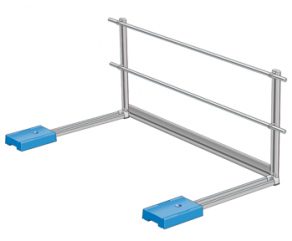 Fall Arrest Railing Systems are also known as Passive Fall Protection. Railing Systems are permanent solutions that do not require Fall Arrest Harnesses and other safety equipment. This allows workers to get straight to work when arriving on the roof top. 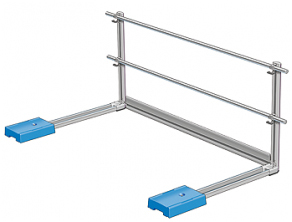 The XS Flex is a freestanding, collapsible upright for securing the guardrail tubes in position. These straight uprights allow you to quickly and easily fold-away the XS Guardrails, making them only visible when roof work is actually being performed. 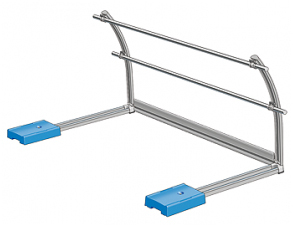 The XS Curved is an aesthetically-pleasing, freestanding, curved upright for securing the XS Guardrail tubes in position. The curved designs provide extra edge protection by keeping people further away from the roof�s fall edge. Thanks to their attractive arc, these curved uprights can accentuate the architectural design of your building.